For over 25 years, Unison Research and Opera Loudspeakers–both made by the Nasta family in Treviso, Italy–have provided beautiful audio products that will exceed your expectations both sonically and visually. Both of these companies have won a plethora of awards from all over the world for their innovative designs, reliable performance and, of course, their beautiful sound. The new Prima is characterized by an excellent sound quality that places it at the top in terms of its size and value. But more than that, it has also been designed to be as efficient, stylish and easy-to-place as possible; suiting it to a wide variety of high-quality audio systems. Opera’s experience, knowledge and select use of components have combined to make Prima a new proposition in the ever-competitive world of hi-fi loudspeakers. The Prima’s 25mm thick cabinet is less than 30cm deep and has rounded edges. Its size makes it suited not just to speaker stands, but it’s also ideal for placement on a shelf in smaller listening rooms. The easy placement is further assisted by the front-firing reflex port, reducing interference from rear walls. Aesthetically, the design has notable similarities to the rest of the Classica Series, with finely polished veneered real wood on the sides and faux leather on the front, top and rear panels. Internally, a wooden brace connects the two opposite sides, forming a rigid reinforcement for the entire cabinet. Elsewhere in the cabinet a substantial amount of 3mm open cell polyurethane sound-absorbing material is employed to stabilise the sound performance. Prima uses the same one-inch Scanspeak tweeter that features throughout the Classica Series because of its first-class characteristics. It’s an extremely solid and powerful soft-dome design that boasts a large decompression chamber and a well-measured use of ferrofluid to cool and centre the voice coil. The tweeter has been specified for 1mm (peak-to-peak) linear excursion, ensuring outstanding power handling as well as very low harmonic and inter-modulation distortion. The woofer is also from Scanspeak and has been specially developed for the Classica Series. It’s a 6.5" (180mm) driver with a 38mm voice coil. The diaphragm is made from aluminium and the rubber surround has been sourced from Dr. Kurt Müller. It is characterized by a particular semi-exponential profile. There is also a copper ring utilised for the stabilization of magnetic flux, effectively reducing distortion in the midrange. Two series of holes are located on the voice coil in order to eliminate the effects of compression behind the dust cap. Internally, the die-cast basket is fully open, even below the internal suspension (spiders), and the driver is connected via gold-plated terminals. All these details contribute together to the Prima’s high quality reproduction in the mid-range. Opera have designed the Prima as a nominal 4Ω load, where to comply with DIN standards the impedance does not drop below 3.5Ω. They are also a very efficient speaker with a comparably high 91dB sensitivity rating. The technical design has therefore resulted in a speaker that’s compatible with a wide range of amplifiers, from valve to solid state. The crossover in the Opera Prima has been designed to be both simple and high-quality. Utilising Mundorf capacitors and MOX resistors (which are made to within very fine tolerances) in the signal path, as well as self-bonding coils for the tweeter and the woofer, the whole design has been optimised to eliminate any interference between the low and high frequencies. The crossover also uses a classical configuration with symmetrical slopes of 12 dB per octave, and the cut-off frequency is set around 2000 Hz. The Prima is an expertly engineered, audiophile-grade loudspeaker that is well suited to a wide variety of home audio systems. Try them now to experience the best of Italian speaker design. The first loudspeaker to bear the Opera name was the Caruso. The Caruso was the first of a series of models named in homage to the legendary voices of the lyric opera. Callas, Operetta and Divina soon followed, each gaining the enthusiastic acclaim of music lovers around the world. That success for Opera loudspeakers then is still the based on the same fundamental principles today. A fusion between the old and the new: between traditional Italian craftsmanship in cabinet-making and the most advanced acoustic technology available. Every Opera loudspeaker, even the least expensive model, follows a tried and tested philosophy of design. In every model, top quality materials are used along with the carefully applied basic principles of acoustic science. Today, Opera is under the same corporate umbrella as Unison Research. Corporate parent Advanced Research In Audio (A.R.I.A.) provides the resources and technical know-how for both Unison Research and Opera that keeps both companies on the cutting edge of product development and innovation. 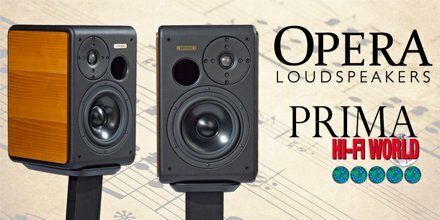 Opera loudspeakers are available nearly everywhere in the world, and are some of the most reviewed and recommended loudspeakers, including recommendations from the most important hi-fi magazines. Opera’s commitment to its customers is to offer a full line of top quality loudspeakers to fit every need and every budget that are as beautiful to see as they are to listen to.